Activists wearing red “Medicare for All” and “Democratic Socialists of America” t-shirts flooded Capitol Hill on Wednesday to attend a press conference where Sen. Bernie Sanders (I-VT) reintroduced a single-payer healthcare bill. 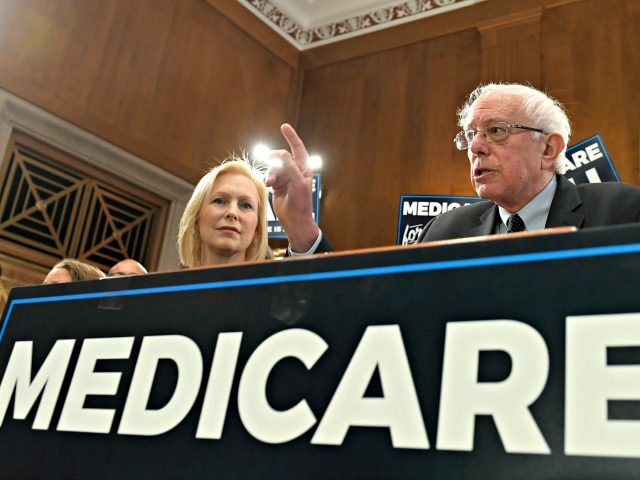 “It is not a radical idea to say that in the United States, every American who goes to a doctor should be able to afford the prescription drug he or she needs,” Sanders said in an Associated Press (AP) report on the press conference. “Medicare for All” is also one of the main planks of Sanders’ 2020 presidential campaign platform. He suggests a tax both on the employee and employer sides. For employees, Sanders says there could be a 4% income-based premium paid by employees, exempting the first $29,000 in income for a family of four; for employers, a 7.5% income-based premium, exempting the first $2 million in payroll to protect small businesses. From there, Sanders proposes a variety of progressive tax changes, including imposing a marginal tax rate of up to 70% on those making above $10 million, taxing earned and unearned income at the same rates, limiting tax deductions for filers in the top tax bracket, establishing a tax on extreme wealth and making the estate tax more progressive, including a 77% top rate on an inheritance above $1 billion. “Health care is a human right, not a privilege,” Sanders said. In the same way that Democrats, including those vying with Sanders for the Democrat presidential nomination, have moved farther to the left with their support of the Green New Deal and reparations for descendants of slaves, they are also joining the free-health-care-for-all bandwagon. Sens. Elizabeth Warren (D-MA), Cory Booker (D-NJ), Kamala Harris (D-CA) and Kirsten Gillibrand (D-NY) are listed as co-sponsors of the bill, according to ABC News, and Gillibrand was on the stage with Sanders cheering with the rest of his fans. “The Medicare for All Act will provide comprehensive health care to every man, woman and child in our country without out of pocket expenses. No more insurance premiums, deductibles or co-payments. Further, this bill improves Medicare coverage to include dental, hearing and vision care,” a summary of the bill given to the media ahead of the press conference said. “Together we are going to end the international embarrassment of the United States of America — our great country — being the only major nation on the earth not to guarantee health care to all as a right,” Sanders said.